Some teachers are respected. Others are beloved. Dirk Bollenback was both. 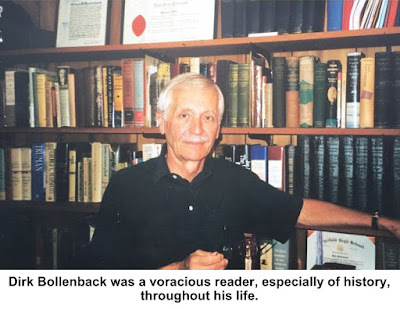 A history teacher for 38 years, Bollenback chaired the Social Studies Department at Ridgefield High School, fought local “book burners” in the 1970’s, and inspired countless students. He was also a singer, leader, and historian at St. Stephen’s Church. year, he was a member of the Pre-Ministerial Club). He earned a master’s degree from the School of Advanced International Studies at John Hopkins and then served in the U.S. Army as a research analyst and instructor in the Army’s Psychological Warfare School at Fort Bragg, N.C. After the Army, he earned a second master’s at Wesleyan University. With his wife Beverly, he moved to Ridgefield in 1958 when he took a job as a social studies teacher at the high school. He soon became department chair, a post he held for 32 years, a period of tremendous growth in the town. The Class of 1959, his first graduating class at the “old” high school on East Ridge, had only 60 students; just over dozen years later, more than 400 were graduating from the “new” school on North Salem Road. 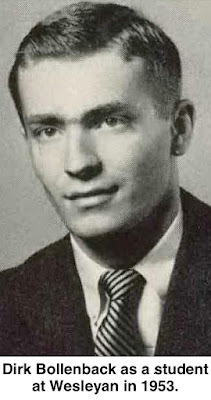 In the 1970s, Bollenback was at the center of the book-banning controversies that involved the high school’s Social Studies and English Departments and some of their book selections, including Eldridge Cleaver’s “Soul on Ice” and Mike Royko’s “Boss.” — both of which some school board members and parents wanted removed from elective courses as inappropriate for high school seniors. In the end both books were retained, but not without bitter confrontations that resulted in national media coverage. He was, in fact, a member of the Republican Town Committee for four years. Over the years countless students sang his praises as an inspiring teacher. 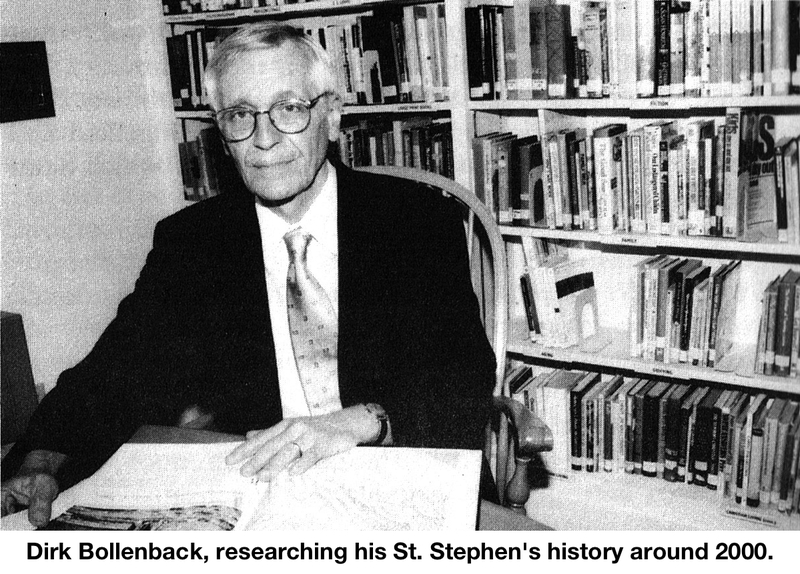 Before retiring in 1996, Bollenback was pushing for a curriculum that focused on citizenship and civility. “Kids today are bombarded with so many different messages from so many different directions that I don’t know how they become civil,” he said in the 2000s. He won many honors throughout his career. 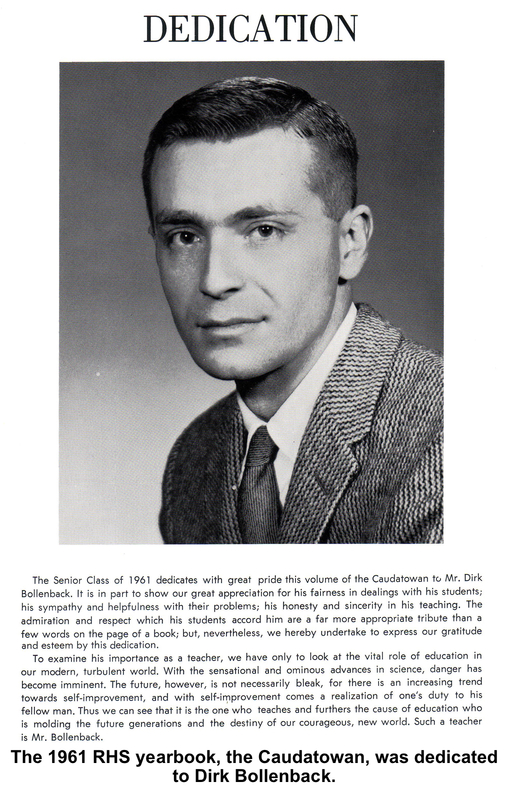 In 1963-64 he was a John Hay Fellow at the Chicago University and won an outstanding teacher award from Tufts University. The League of Women Voters honored him in 1996 for service to school and community and, in 2013, he was the first teacher to receive the Ridgefield Old Timers Association’s annual Distinguished Educator award. In the community, Bollenback volunteered as a patient’s representative at Danbury Hospital and for more than 25 years sang in the choir of St. Stephen’s Church, where he was a member of the vestry and served in other posts. He was also the church’s historian, which sparked a “second career” as a writer. To mark St. Stephens’ 275th birthday in 2000, he spent nearly three years researching and writing a book that picked up where Robert Haight’s 1975 history had stopped. “He has done a marvelous job of incorporating the history of the parish with the national events that were unfolding,” Rector Richard Gilchrist said at the time. Bollenback died in 2017 at the age of 86. His wife, Beverly, who had been active in the Ridgefield Visiting Nurse Association and had been president of its predecessor District Nursing Association, had died in 2004. Artist/illustrator Jean McPherson, who became his partner in 2009, died in 2016. Cheney said in a 2012 remembrance that Bollenback was better than any other high school teacher or college professor he’d ever had.